Oct. 26, 2011, 2:30 p.m.
By Megan Garber @megangarber Oct. 26, 2011, 2:30 p.m.
One of the most common complaints about newspapers’ adaptation to the digital world — or, depending on your perspective, their lack thereof — is their failure to create their own versions of Craigslist. Papers ceded the market of micro-marketing, the complaint goes…when, with a bit of foresight, they might have built platforms that might have preserved, at least to an extent, their all-important classified revenue streams. So goes the argument. But it doesn’t follow that, in 2011, Craigslist has completely cornered the market on classified advertising — or, for that matter, on community messaging overall. Today, a major paper is getting into the community messaging game: The Guardian is launching n0tice, a social news platform that draws a little from Craigslist, a little from Foursquare, a little from Ning. The team will soon expose n0tice’s read API, as well. Mutualization! n0tice is Craiglistfully easy to use: When you go to the site, it will first detect whether you’re coming from a mobile device. (It was designed for the iPhone first, McAlister notes, but has a desktop version, as well.) Once you agree to location-reading permissions, the site will grab your latitude and longitude — using the Google Maps geocoder and Yahoo’s geo services — and then show you what’s recently been published to n0tice near your location. In the 1980’s and 90’s the dial-up online bulletin board systems or BBS’s made the noticeboard concept come alive in the digital space based on what technology was available at the time. Email enabled mailing lists that acted like noticeboards. And, of course, the web and Netscape made browsable noticeboards possible in digital space, such as Craigslist. 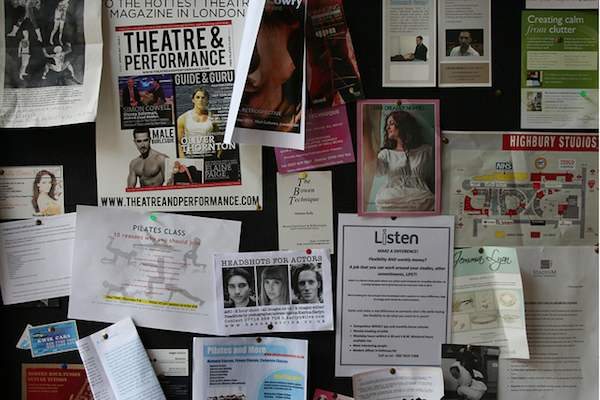 But few models for community noticeboards have taken off in a social-local-mobile world, so far. In other words, as McAlister puts it, n0tice is taking “a space and time” approach to advertising. Which is one that makes, on a location-based platform, a world of sense. Image by n0tice used under a Creative Commons license. POSTED Oct. 26, 2011, 2:30 p.m.
Garber, Megan. "The Guardian launches n0tice, an open community news platform." Nieman Journalism Lab. Nieman Foundation for Journalism at Harvard, 26 Oct. 2011. Web. 24 Apr. 2019. Garber, Megan. "The Guardian launches n0tice, an open community news platform." Nieman Journalism Lab. Last modified October 26, 2011. Accessed April 24, 2019. https://www.niemanlab.org/2011/10/the-guardian-launches-n0tice-an-open-community-news-platform/.